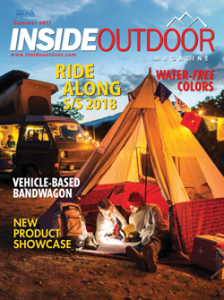 The gaps between manufacturing realities and environmental pronouncements have proactive outdoor companies looking for answers. Among the host of manufacturing challenges confronting these companies, the upstream problems related to the dye process continue to raise environmental concerns. Dyeing textiles is very energy and water intensive, and the nature of dyes makes them stubbornly persistent and often toxic once released into the environment. The outdoor industry’s reliance on polyester (PE), in particular, adds volume to the already massive use of the most commonly manufactured textile worldwide. In 2014, demand for polyester was approximately 55.2 million tons (122 billion pounds), in contrast to protein-based fibers such as cotton and wool at 25.4 million tons. PCI Wood Mackenzie, a Scottish consulting group, projects demand for PE in 2030 to be around 70 million tons. The same timeframe sees growth in the second most processed fiber, cotton, at just more than 30 million tons. Fortunately, new technologies continue to arrive, presenting compelling cases to ditch the entrenched paradigms of today’s dye industry. To fully appreciate how much better these new technologies are, an understanding of what constitutes the hot mess of today’s current technology requires a short primer. Getting color into our mountain parkas, school daypacks and Burning Man tents is achieved through several commonly used processes. Because of the variables encountered with different finishes and fibers, the actual dyeing treatment can start at various points up to the finished product. For example, filaments can be spun into yarn, then the yarn dyed by the package, a kind of king-sized spool. Globally, the most common method has un-dyed yarn woven or knitted into fabric, then dyed (piece dyeing). Figure 1 shows a generic flowchart of the processes involved in the manufacturing of textiles. Water figures prominently throughout the entire process, yet within that process, the dye step consumes a large share of it. Although cotton by far uses the most water in becoming a finished product, the focus here is on the outdoor industry’s reliance on polyester, not to mention the vastly larger world market. It is not always easy to see polyester for what it really is: a plastic. Dyeing this plastic is complicated, requiring lots of water, heat, pressure and special dyes to change it into a wide spectrum of familiar outdoor products. Its transformation into a textile uses 220 to 440 pounds of water (100 to 200 kilograms) for every pound or kilogram manufactured. To speed the dyeing process to three or four hours, heat of more than 212 F (100 C) plus tank, jet or roller pressure is added. Disperse dyes (chemically enhanced pigment) have been formulated to dye polyester and, for various reasons, 8 percent to 20 percent of the dye is not affixed to the textile. This amounts to an estimated loss of more than 200 tons of dye annually, most going into local water supplies (Ogugbue, CJ. et. al. in “Bioremediation and Detoxification of Synthetic Wastewater Containing Triarylmethane Dyes by Aeromonas hydrophila Isolated from Industrial Effluent,” 2011). Since dyes are designed to resist degradation by “light, temperature, water, detergents, chemicals, soap and other parameters such as bleach and perspiration,” wastewater treatment plants are not able to adequately treat factory effluent (Chequer, Farah Maria Drumond, et. al. “Chapter 6: Textile Dyes: Dyeing Process and Environmental Impact.” Eco-Friendly Textile Dyeing and Finishing. Ed. Melih Günay. InTech. 2013. 151-176). As a result, the local water supply is not only diminished by the textile factory’s response to the growing demand for polyester, water that does get returned to the community is damaged goods. Finally, disperse dyes have their own set of problems. DNA mutations has been noted in various studies as well as allergic contact dermatitis, eye irritation and chronic toxicity. Polyester’s ubiquity in the outdoor market and its consequential impact have given rise to technologies aimed at improving the dye process on several fronts. One of which was featured in Inside Outdoor Summer 2014, “Dyeing to be Clean,” a look into waterless supercritical CO2 dyeing. Another new approach, with potential lower cost of process integration and with low or no water usage could well be a formidable competitor. These two disruptive technologies have similar ends, but the following illustrates how different they are, starting with supercritical CO2. A supercritical fluid (SCF) is simply a lesser known phase of matter unlike the very familiar solid, liquid and gas states. 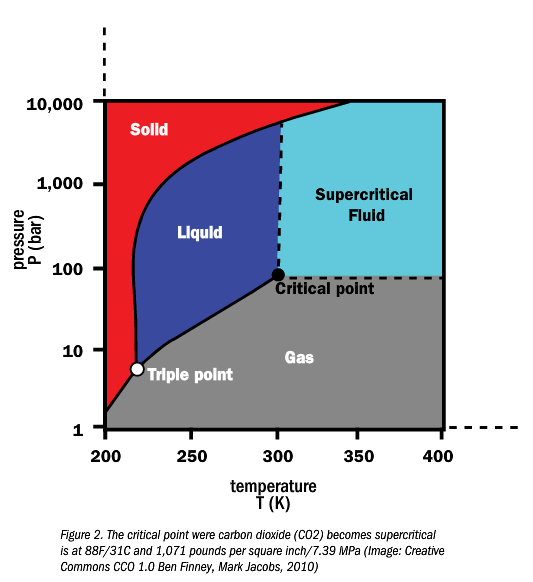 The supercritical phase is where matter transitions back and forth between a liquid and a gas (Figure 2). The Yeh Group’s Drydye Technology takes advantage of polyester’s physical characteristics and combines them with carbon dioxide’s super criticality to make a waterless dye process. What makes CO2 especially well-suited to this process is its ability to swell polyester. Additionally, enabled by its gas-like, low-viscosity behavior, the dyes piggybacked on the supercritical CO2 are more uniformly deposited throughout the swollen microscopic nooks and crannies that make up polyester. When the CO2 is removed, the polyester returns to its original shape, locking the pigments in. The end result is a very consistent, permanent color in contrast to water-based dye baths that require heat, pressure and time to force good color saturation throughout the polyester. How waterless is Drydye? As noted above, the actual dyeing can take place at various points along the dyeing process. Drydye begins its intervention after the pre-treatment process seen within the red box in Figure 1. From that point forward, the dye process is waterless. That is because supercritical carbon dioxide is used instead of water to carry the dye. Yet the advantages do not stop there. The supercritical process is conducted in a closed environment, so 95 percent of the CO2 is captured to be used again in the next batch. Since the dyes do not require additional chemical enhancers or surfactants, and the dye uptake is efficient, unused dye is recovered and recycled. Furthermore, the dyed products are dry and very clean, obviating the need for any washing, rinsing and drying – all resource intensive stages. It follows, therefore, lower resource demands translate into less air and water pollution emissions at the pipe. In a Life Cycle Impact Assessment (LCIA) carried out by PE International and 5 Winds, it was determined the energy savings from cradle-to-gate by supercritical CO2 to be around 35 percent over jet dyeing. However, the overwhelming takeaway from the LCIA is, dyeing with SCF CO2 is considerably more eco-friendly than traditional dyeing could ever be. Even so, what if the dyeing process started as the fiber is being created? How would that change the narrative? That is what e.dye believes its technology can do. The twist is an all-important one in which without it, e.dye would just be any other solution dye process. In effect, the improvement was not on the process itself but in e.dye’s move to help jumpstart the adoption of this technology. To understand how a strategic change to the business model can make that happen is to know solution dyeing. 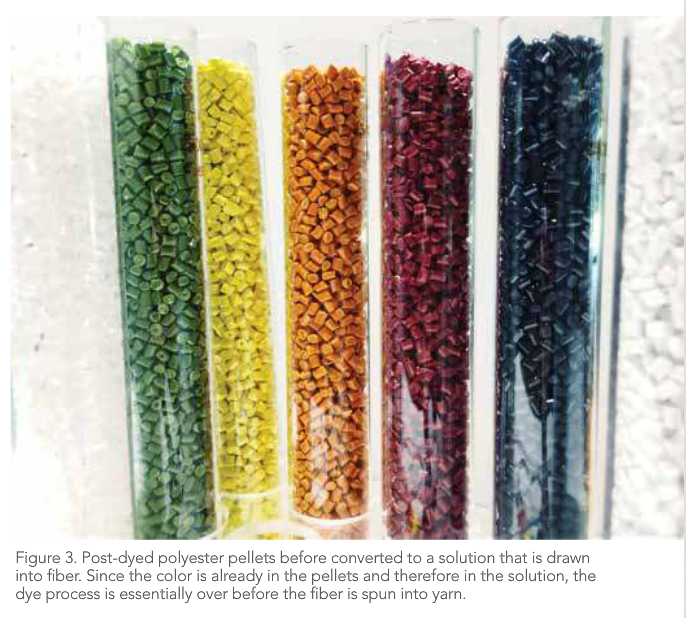 The key to solution dyeing is adding pigment to the molten polyester as it is being made into pellets, then later re-melted and extruded into fiber (Figure 3). This process locks the pigment into the polyester filaments, making it resistant to fading by repeated washings, exposure to sunlight, bleach and sweat. Hard to dye textiles such as polypropylene, nylon and rayon can be dyed using this process. 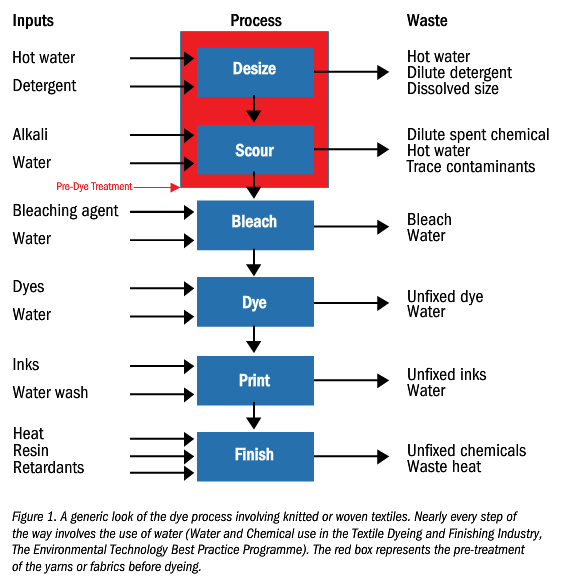 Going back to Figure 1, solution dyeing would begin in a new process box at the top of the flow chart, making many of the processes to follow redundant. Various rinse, wash, chemical agents and heat cycles are eliminated, as well as any dyestuff that could be flushed out of the factory and into the local water supply. Given that, solution dyeing’s environmental upside potential is worth a critical look despite the downsides, which tend to be the high cost of setup, minimum order quantities, incompatibility with protein-based fibers and limited color availability. This is precisely where e.dye differentiates itself in the solution dye space. E.dye has invested in its own pilot factory to prove that this technology can be brought into the mainstream in the outdoor segment. “We have produced 3,800 colors, and we have virtually no color minimum because we control the industrial process,” Murphy explains. This alone will help bring solution dyeing’s barrier-to-entry within reach of a larger audience of environmentally and cost-conscious manufacturers. As good as this sounds, how does solution dye color compare with traditional piece dyeing? The finished products are indistinguishable side-by-side. Solution dye performance is without compromise with e.dye adding yet another twist to the process. The issue of color fidelity has always been a long-standing problem in the dye industry. E.dye resolves the problem by using a proprietary color matching and prediction system, the basis for its intellectual property. The company formulated its own color recipes in master batches, essentially creating a unique, reproducible, library of color standards. This is in stark contrast to piece dyeing houses where color matching is ideally a best guess. E.dye’s Innovation Center in Kunshan, China, ensures color curves and physical samples produced in-house meet client specifications. For designers, buying a stock yarn color from e.dye saves time and money, but according to Murphy, half opt for custom solutions. If there is a match and the colorant exists, says Murphy, it only takes three to four days to create a new recipe. Therefore, how do the two competing dye technologies stack up? Neither Drydye’s supercritical CO2 nor e.dye’s solution dye process use any water during the dyeing phase. That is a positive step knowing how resource exhaustive and polluting traditional piece dyeing is. Yet circling back to Figure 1, it is just one step of many in the textile manufacturing process, several of which use lots of water, chemical treatments and energy. All of which negatively impact the communities surrounding the textile industrial areas. Their water supplies, water treatment and air quality are all under duress. Realistically, it is going to take years of collaborations before textile manufacturing will match the level of clean Drydye and e.dye has brought to the textile process. Yet if the most egregious part of the textile process can be scrubbed, so can the rest.